Google has slowly moved most of the support groups to a new platform better suited for question answering. Unfortunately, you still needed to find the proper help forum where to post your question. 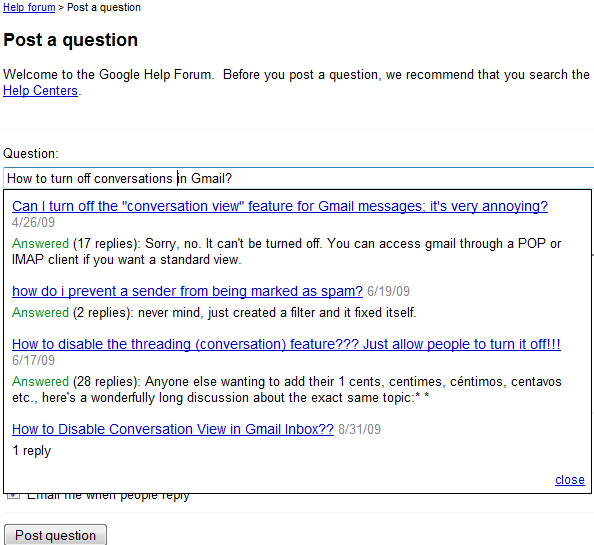 Now you don't have to visit Gmail's forum to post a question about Gmail. Just go to this page, type your question and choose the appropriate Google product from the drop-down. Google even lists similar questions and their answers when you type your question, which is great because many people forget to search before posting. By default, you'll receive an email notification when someone answers your question. "Google even lists similar questions and their answers when you type your question, which is great because many people forget to search before posting." Unfortunately this feature does not search the existing Google help topics on the same keywords, this makes it much harder to find answers that are hidden in the official help. Also selecting a category does not restrict the answers to those of the category making this feature confusing instead of helping. Displaying answered posts only also does not always help, e.g. when someone experiences an issue that affects many users but for which there is no solution yet. Instead of hooking on to an existing thread this makes users post the same issue over and over again; this in turn makes the forums harder and harder to use. Apparently Google is moving to using Help forums that are unmanned, leaving answering to users as a kind of self-help. That would be OK if the official help for product was comprehensive - which it is not, and if the few Top Contributors would be able to have a direct dialog with the Google Guides on issues that need official intervention - this also is absent. All in all this means that the service on Google products is getting worse and worse. In essence user are presented with a 'free' product but have to puzzle out themselves how to use it. And even that would be largely acceptable if Google products would not change over night without due warning an without any explanation. 1. Google should discourage users from asking the same questions over and over again. Many people forget that the search box is useful and they ask old questions. 2. Google should discourage users from asking vague questions, so it would be useful to provide some templates, especially for troubleshooting. 3. Power users should be encouraged to contribute with helpful answers. The current reputation system is a step in the right direction, but top contributors should get more rewards. 4. Each service should include an interactive help system that explains the most important features. Many people don't understand features like "archiving" or "labels" and the UI should do a better job at explaining them. @1 Google scatters its information too much about. E.g. for Google Docs there is the official help, the current forum, the old forum, the official blog, Knol articles, the New features page and some announcement blogs they seem to have abandoned again. Users can't get to information when it's scattered about like that. @2 Again for Google Docs they started 'Google Docs comprehensive troubleshooter' which is a good initiative, but they also allow comments on the trouble shooter as another dissociated thread (which is another place people think they can post their questions). @3 There is only so much incentive a power user needs, (s)he also needs access to information (e.g. a bug tracker, or a listing of all known issues) to be able to help. A real dialog with the Guides - not a post in a private forum and a fraction of a chance someone reacts - would also help a lot. As it is now power users are expected to help, do triage, escalate issues and act as unpaid guides, without getting anything in return that makes such work easier or more efficient to do. (E.g. when trying to help someone in the GDocs forum, and attempting to find a reference to an official help topic the 'Add references:' option does not allow searching the official help. A power user is forced to open up the help a search for the subject to reference and has to copy and URL and description of the help topic instead of having a one click Add option). @4 I totally agree with that. There should be a mock interface which not only shows how Google names all the buttons, links that are menus, menus that are links, etc. but also a glossary (like already in use for some Google product) that teaches the user that e.g. a document can be either a text document, a spreadsheet, a presentation or a PDF file, but also that a workbook sometimes is called a spreadsheet and a spreadsheet a sheet, just to name a few. And explanation of the idea behind the interface is absolutely required, even though the Google developers think everything they create is intuitive, it absolutely is not. And Google should should add a mission statement for each of its applications, if only to tell the user what are Google's ideas behind it and how and why it want people to make use of it. This is similar to Answers of Launchpad.net, service of Canonical, where Ubuntu is developed. I have a Google Website at http://sites.google.com/site/noahite/home but Google will not find it. I have tried searching for the reason and looking in the help forums as well as looking for blogs. Can anyone send me help in this regard? My website has my email address. I have a Google Website on Google but Google will not find it. I have tried searching for the reason and looking in the help forums as well as looking for blogs. Can anyone send me help in this regard? My website has my email address. I think that Google needs to support its custmers. "I have getting this error for over 10 days and have suffered a number of significant personal problems as a result. I have been using Gmail for over 4 years now with Outlook under SMTP but recently changed to IMAP to help clean up the very large number of old emails. I was able to delete a very large number of them, but decided to move back to SMTP because of the lack of speed using IMAP. When I switched I made everything as unread and moved it into the inbox. I was able to capture all of my old mail - from 2005 to December 2008 when I began to get this error and was precluded from doing anything. Every once in a while (no more than one time a day), I get connected for a little while and am able to download about 315 emails and then I am shut off again. I have tried to use using your “Help Forum”. Even if you are unable to help –PLEASE TELL ME! I need to make arrangements." I received an auto rely telling me to use the “Help Forum”. I feel that I am just ignored on that forum - maybe because the Top Contributors don't have anything to say. Bottom line for me is - No Mail for 13 Days. Tomorrow will be a month without my Gmail account working - bad things have happened to me as a direct result and they do not seem to even care. I can't think of any reason to think they even have support - let alone that it is somehow better.